Recently I was searching for a dessert which would be saying ‘Good-Bye!’ to summer, while – at the same time – it would be welcoming the upcoming fall season. I was searching and now I am searching no more because I’ve found all that I was looking for in this delicious treat. In case you wondered, I will describe all the lovely levels of this dessert for you: it all starts with a lovely cookie-like layer on the bottom, then it continues with a creamy and delicious cream cheese filling with chunks of delicious cinnamony apple scattered here and there, then there’s a crumbly and crunchy topping, and finally – a good portion of luscious caramel on top. It all begins with all these ingredients. 2. In a bowl, combine the flour (1 cup – 140 grams) and brown sugar (1/2 cup – 100 grams). Cut in the butter (1 cup – 230 grams) with a pastry blender (or a fork) until the mixture is crumbly, kinda. 3. 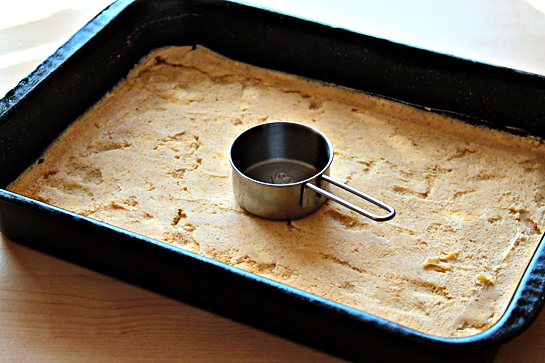 First with your fingertips, then with the bottom of a cup (or a glass), press the dough evenly into a 13 × 9-inch (33 x 22 cm) baking pan or a cookie sheet with edges. Bake 15 minutes or until lightly browned. 4. 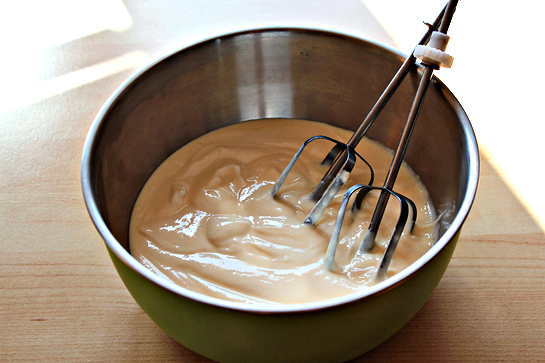 In the meantime, in a larger bowl, beat the cream cheese with 1/2 cup sugar until smooth (about 1 minute). Add the eggs, 1 at a time (beat about 20 seconds after each addition). Next add the vanilla and mix until combined. Make sure not to over-beat the cheesecake batter as this will lead to excess air being incorporated in and may cause cracking later on. 5. 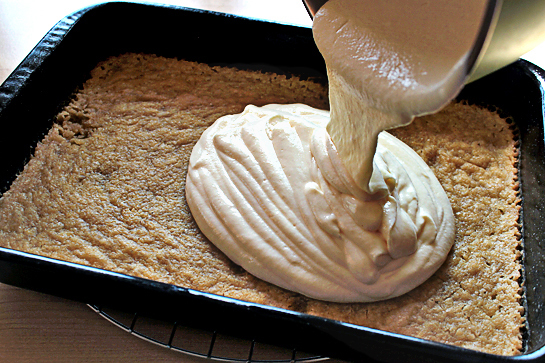 Pour the cream cheese batter over the warm crust. 6. Peel the apples and chop them into 3/4-inch (2 cm) chunks. 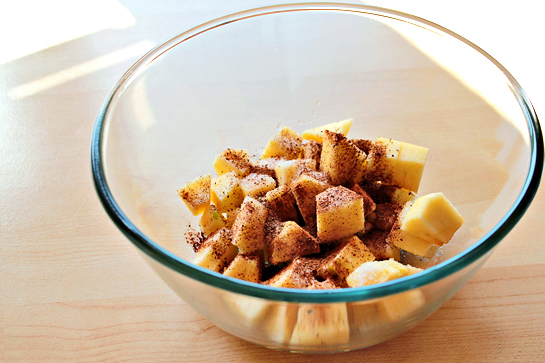 Mix the apple chunks with the cinnamon and two tablespoons white sugar. 7. 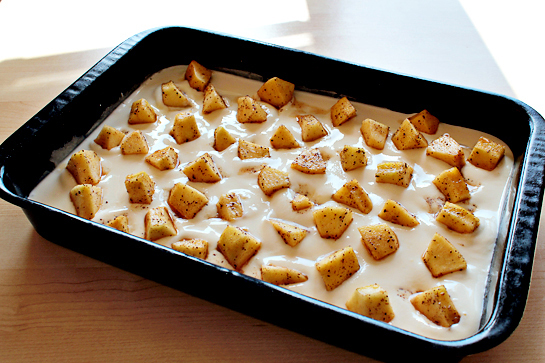 Spoon the apple chunks evenly over the cream cheese mixture. 8. 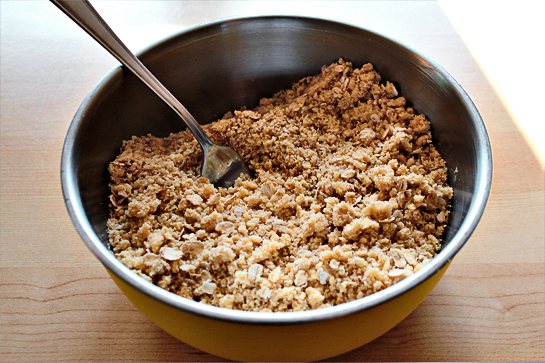 In a smaller bowl, combine the flour (1 cup – 140 grams), oats (1/2 cup – 60 grams), and brown sugar (1/2 cup – 100 grams) for crumb topping. 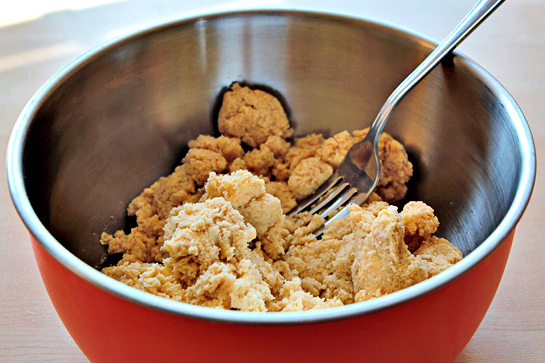 Cube the butter (1/2 cup – 115 grams) and using a pastry blender (or a fork), create a crumbly mixture. 9. 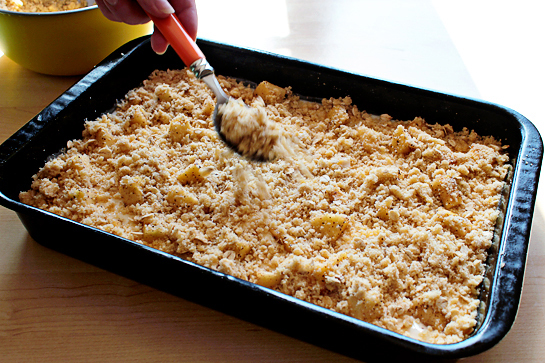 Crumble over the cream cheese mixture. 10. Bake 30 minutes, or until the filling is set. Reduce the temperature to 300 °F (150 °C) for the last 5 minutes. 11. Cut into bars (3 x 3 inches/7 x 7 cm). 12. And drizzle with the caramel topping. It looks unbelievable to me, like these bars can’t come from this planet!!! Wow perfect fall gorgeousness. The caramel is mouth watering! It’s like my favourite TGI Friday’s dessert!! I have to try this!!! It seems so perfect, and homemade!! It must be even more delicious than the TGI’s one. OMG, these look amazing! I’m practically drooling from my office desk right now. I could eat these everyday! I love the combination of apples and cinnamon! OMG, the picture make me drool, i feel like bitting my monitor off! May I know if you uses red or green apple? Oh wow! Please tell me you are kidding with these?! I cannot be trusted around a batch of these. They look way to good!! Beautiful!!! Well don’t these just look terrible 😉 What a great way to start off the Fall. Can’t wait to try these! Petra, dalsi skvely recept, vyzera uzasne. Prosim Ta, aky cream cheese tu na Slovensku kupujes? Dakujem. Ahaaa, ze jaka finta:) Super, dakujem. I made these for a co-worker’s birthday and they were a huge hit around the office!! 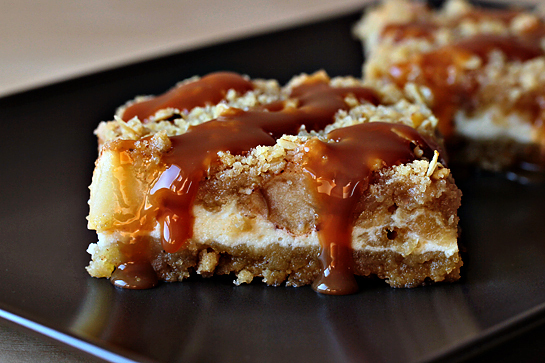 Perfect way to put a twist on apple pie/crisp. Thanks for sharing! Thank you for this recipe! My kind of dessert! Petra, i also love to cook and taking pictures of it. however, there are a couple of times when it’s a total failure. it wasn’t the case with this recipe. i came through your website by browsing tastespotting.com and immediately felt the urge buying ingredients for this delicious cake. i am gluten allergic so instead of flour i used brown rice flour. since it is not as powdery as regular flour i had to use a little less butter. so. i just sliced it even it was still hot and we L.O.V.E. it! i will definitely pass it on to my family and friends! I tried these and they were wonderful! Personally, I don’t like ultra sweet so the caramel topping was a bit much for me, but I loved the bars without the topping. I didn’t know you could put so many delicious things into one dessert! Definitely going to be making these soon! Wow, I’m totally speechless. These look perfect! These look amazing. They are a must try. I am currently on my second batch of the bottom “cookie” part. I’m not sure what I’m doing wrong but the dough is very gooey. I used a fork to cut the butter in but it’s still gooey. Yours doesn’t look that way. Tip? Advice? I had the same problem as Veronica with the dough. I couldn’t press it down with a measuring cup because it stuck to the bottom. Do you think it is because I used margarine instead of butter? Welcome to our sweet food club! I am happy to see you here. I hope you liked the cake. I pressed down the dough with my fingers, I used the measuring cup only to smooth out the surface. i CANNOT wait to try this recipe! these look like little drops of heaven. the only downfall…. i’ll probably eat them all in the first day!!!!! Oh my goodness! What lusciousness! Made these today as a little pre-christmas dessert and they are absolutely delicious! Also great to serve with caramel ice-cream when it’s still warm. Will definitely make it again. Also, about half of my christmas-dinner consists of your recipes! Love your blog! 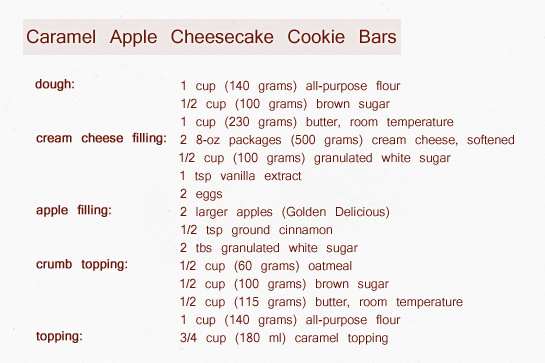 I have been looking for the all-in-one bar cookie that incorporates our favs; apples, cheesecake & caramel! Guess what? I’ve found it on your site. Your pics are unbelievable, and if this cookie is as good as it looks my hubby will be in heaven! O. MY. GOD….This is just cruel… MUST. MAKE. NOW. please tell, do u serve this hot or cold? wh/ way is more knee-wobblingly delicious? Oh i think im about to cry. i live in sweden and its really hard to fing all-purpose flour, but can I use baking powder and flour instead? should the baking pan be lined? These were made and readily devoured by my entire immediate and extended families. Absolutely fantastic recipe, and highly versatile. This is already a go-to recipe. Thanks a million! 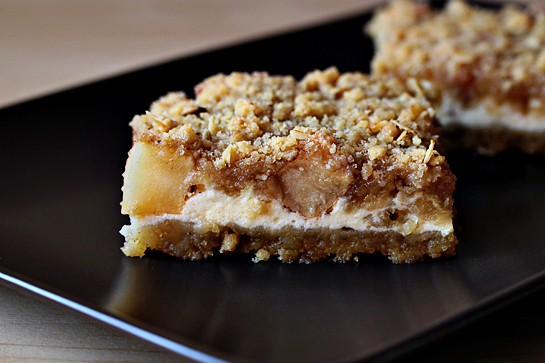 These bars are amazing and very easy to make. Thank you! I made these for family and we loved them, but I thought the crust was too putsy and will use a simple graham cracker crust next time. Otherwise was quick, easy and a great way to use up those last couple apples in the fridge. It keeps well, too. We metered them out to last a week and they were as good on the last day as the day they were baked. Do you need to grease the bottom of the pan or is there enough butter in the crust ? Is this correct for the crust—2 sticks (1 cup) of butter? Seems like way too much butter for the amount of flour & sugar. Help! I grumbled when some of the ingredients put me over my grocery budget. I grumbled because I used every bowl in the house. I grumbled because I thought the effort was a lot of work . . . And THEN, I tasted . . . My, Oh, My! What a delight! Thank you so much! Wow, what triple delight in one bite, thanks. Trying this recipe right now! Crust is in the oven. 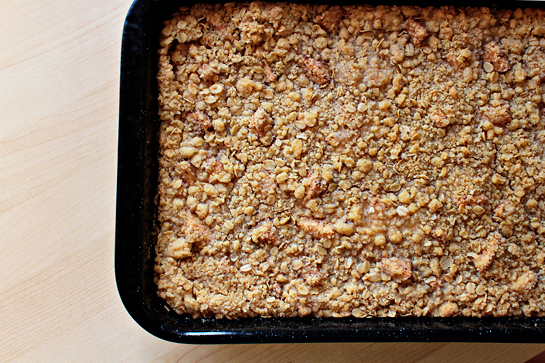 I don’t use brown sugar (I use organic sugar instead, which has a different texture) and the crust and topping recipe turned out something more like cookie dough, so I ended up melting the butter and adding breadcrumbs for more of a crumbly texture. Hopefully it will work out for the topping as well! You know they make organic brown sugar right? If you have a Trader Joe’s in your area they sell it there. In the ingredient list you have 1 cup of flour. When I was putting the ingredients together it didn’t seem like enough flour, I checked the original recipe and sure enough…it’s 2 cups of flour. It’s just come from the oven and it looks and smells divine can hardly wait for tomorrow’s dessert! Do you have to put it on the fridge? Or you serve it hot? I have a party of 20 people on Sat should I bake it Friday afternoon and place on the fridge or you suggest me to do it on Sat before everyone show up?